A brain drain and budget cuts are endangering the long-term manageability of the Internal Revenue Service, its commissioner warned on Tuesday, though employee handling of the current tax filing season is going “swimmingly,” contrary to expectations. 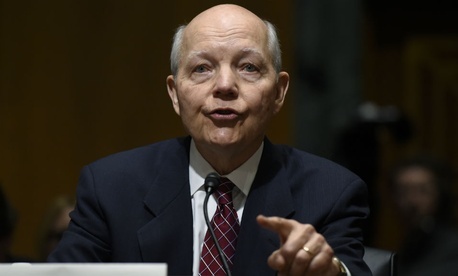 Koskinen also warned that more than half the IRS’ current 87,000 employees are over age 50, with more than 25 percent eligible to retire next year. “We only have about 1,900 employees under age 30 – and about half of those are only part-time,” he said. “Essentially, the IRS is facing its own version of the Baby Bust” of trained professionals. This situation, made worse by the budget cuts, “makes it extremely difficult, if not impossible, for the IRS to properly develop its next generation of leaders,” Koskinen added. The portrait he painted of the agency was also one of pride in progress. So far this filing season, the IRS has issued more than 71 million refunds, assisted 24.2 million taxpayers on telephone help lines and helped 1.3 million people who visited Taxpayer Assistance Centers around the country, he reported. The IRS website has expanded to draw 231 million visits. The agency’s 100 tax preparation videos on YouTube have attracted 9 million views. And the backlog of applications from nonprofits for tax-exempt social welfare status—the source of the political targeting controversy of roughly the past two years—has been sliced from 60,000 to zero, Koskinen said. Responding to questions, the commissioner said he is confident that there will be no repeat of the inappropriate scrutiny of nonprofits based on their political rhetoric because “we will hear from employees” if such things recur. “There’s a commitment to being in tax administration, not politics,” he said. To cope with the tight budgets, Koskinen said, his team is continuing to train employees and take advantage of an Office of Personnel Management phased retirement program for mentoring and working with the IRS’ Human Capital Organization. “I have advised our senior leadership that this is the last year that we will deal with budget constraints by freezing or severely limiting new hires into the agency,” he said. “We have interesting and exciting career opportunities to offer to young people beginning their careers, and we need to encourage more of them to join the agency." Addressing the problem of identity theft with intention to claim other taxpayers’ refunds, Koskinen noted that the agency this month had an “unprecedented sit-down meeting with the leaders of the software and tax industry and state tax administrators” to boost a public-private partnership to tackle the problem.